Car Culture at Dead Man’s Curve. Have We Reached Peak Pick-Up? Univ. of Michigan researcher Michael Sivak has been producing a steady stream of reports hailing the onset of peak car, the high point of American car ownership. Tuesday he released a few more charts hammering home the point and a study showing even pick up truck popularity is on the decline since a peak around 2006. Either way, the conclusion Sivak suggests is a cultural shift away from car culture. “These reductions likely reflect, in part, noneconomic changes in society that influence the need for vehicles (e.g., increased telecommuting, increased use of public transportation, increased urbanization of the population, and changes in the age composition of drivers),” he writes. 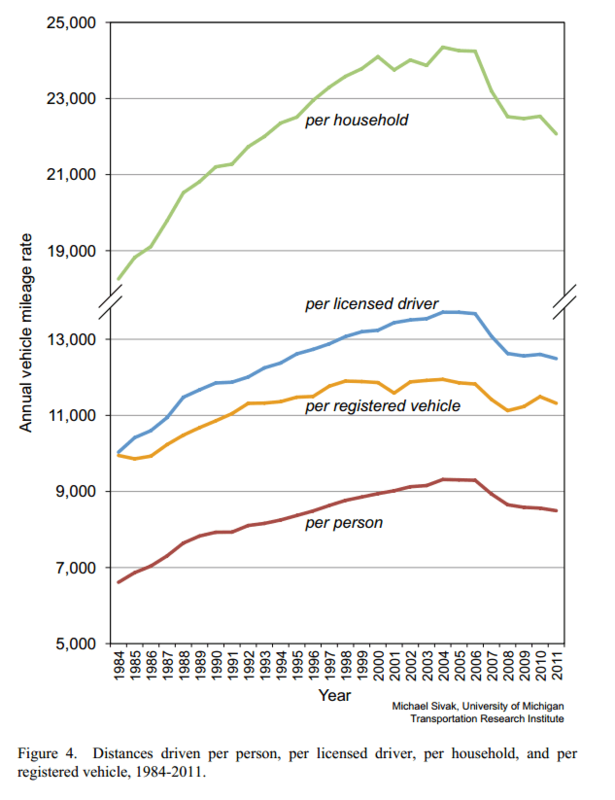 Sivak’s paper, “Has Motorization in the U.S. Peaked? Part 2,” posted to the Univ. of Michigan website Tuesday shows how the peak car phenomenon applies to light-duty vehicles as well. That classification includes small commercial trucks, vans, SUVs and pickups, exactly the auto segments you might expect to be resistant to cultural shifts against driving. The people who rely on them need vehicles for work or are more likely to live in rural or suburban areas where giving up a car in favor of transit is less feasible. But nonetheless, peak pickup has also come, he argues. The peak for miles driven of light-duty vehicles was 2006, 2.77 trillion miles. In 2011, it was 2.65 trillion, a decrease of 5 percent. Similar trends apply to vehicle ownership. “We now have fewer light-duty vehicles and we drive each of them less than a decade ago,” he writes. Paul Douglas on rising sea level estimates, and record rains this summer. Scientists have known for some time about the risk of large-scale carbon emissions from thawing permafrost. But in recent years, they’ve become increasingly attuned to an additional—and very worrisome—aspect of this threat. As climate change proceeds, larger and more intense wildfires are increasingly scorching and charring the forests of the north. While these fires have always been a natural and recurring aspect of forest ecosystems, they now appear to be undergoing a major amplification. And that, in turn, may further increase the threat of permafrost thawing and carbon releases—releases that would, in turn, greatly amplify global warming itself (and potentially spur still more fire activity). “You have this climate and fire interaction, and all of a sudden permafrost can thaw really rapidly,” explains Jon O’Donnell, an ecologist with the National Parks Service’s Arctic Network. Scientists call it a “positive feedback,” and it’s one of the scariest aspects of global warming because, in essence, it means a bad situation is making itself worse. 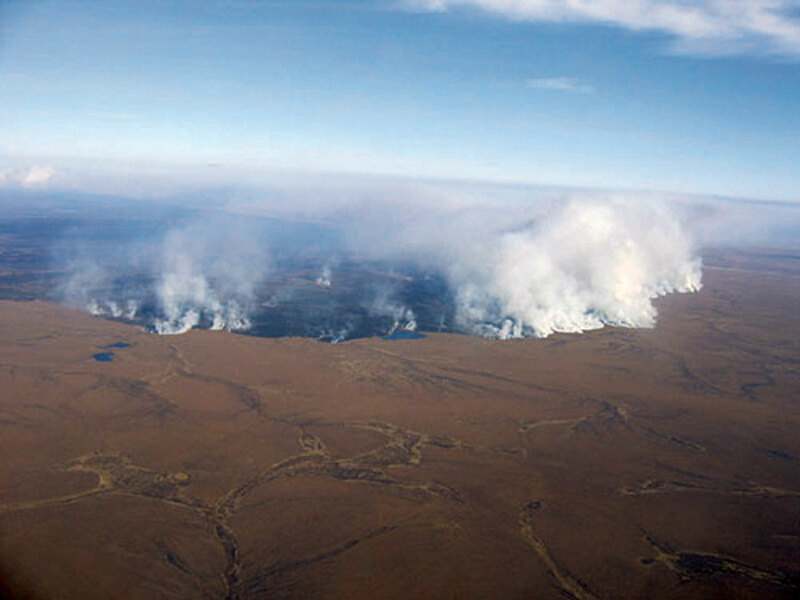 When it comes to understanding the wildfire-permafrost feedback and just how bad it could be, one factor is clear: Wildfires are definitely getting worse. “The area burned by wildfires has been increased quite a bit over the last couple of decades,” says Terry Chapin, a biologist at the University of Alaska-Fairbanks. Indeed, a new study just out in theProceedings of the National Academy of Sciences suggests that recent fire activity in these “boreal” regions of the globe is higher than anything seen in the last 10,000 years. Further underlining Climate Change’s maturation as a potent political issue – a new ad in the Virginia Governmental race features GOP candidate Ken Cuccinelli’s crazed fixation on persecution of climate scientist Mike Mann. RICHMOND — The newest TV ad in the Virginia governor’s race focuses on Attorney General Ken Cuccinelli II’s legal battle with a University of Virginia climate scientist. Titled “Witch Hunt,” the commercial recalls a two-year effort by Cuccinelli, the GOP nominee for governor and a climate change skeptic, to obtain records from Michael Mann, then a U-Va. researcher. The campaign of Terry McAuliffe, Cuccinelli’s Democratic rival, released the ad Monday. It declined to say where it will run and for how long. The ad is part of McAuliffe’s broader strategy to portray himself as a business-oriented moderate and Cuccinelli as someone outside the mainstream on a range of cultural issues. The opening image of the ad shows McAuliffe sitting at table, having a seemingly productive discussion with others gathered there. In 2010, Cuccinelli issued a civil investigative demand — essentially a subpoena — for grant applications and correspondence exchanged among Mann, research assistants, and scientists around the country. He based that demand on a 2002 state law designed to combat government employees defrauding the public of tax dollars. Cuccinelli said he was trying to investigate if Mann had, while seeking grants to study climate change, had used manipulated data to show that there has been a recent spike rise in the Earth’s temperature. The story became national news as part of a broad campaign by right wing science denial groups to intimidate, spy on, and persecute scientists whose research ran counter to fossil fuel and other corporate interests. Dr. Mann discussed the episode in his Chapman lecture here . Latest video for The Yale Forum on Climate Change & the Media, the first since returning from Greenland – includes interviews with Ice expert Alun Hubbard, who I met in Kangerlussuaq, as well as a snip from Richard Alley, at June’s Chapman conference in Granby, CO, and Jason Box, who spoke from our DarkSnowProject HQ in Sisimiut, in early July. Takeaway – Greenland represents 22 feet of sea level rise, it’s moving faster than anyone thought it could just a few years ago, and there are processes occurring deep in the ice that may make even faster movement inevitable. According to Hubbard, we may we witnessing the deglaciation of a major ice sheet, with serious global implications. Complex systems are hard to change, but when they do begin to transform, those changes can come rapidly. It’s true of politics as it is of ice sheets. I posted last week on new polling data showing young people regard climate denial as a sure sign of ignorance, stupidity, and blindness. National Journal chimes in with analysis. In the summer of 2009, a dozen Democratic members of Congress took a deep breath and put their political futures on the line, voting for historic global-warming legislation President Obama had told them was a top priority. After the bill squeaked through the House, Democrats pleaded with the White House: After taking this risk, they needed Obama to go to bat for them—and the bill—with speeches, campaign appearances, constituent outreach, anything. He didn’t. Behind the scenes, White House advisers counseled the president not to waste his political capital on climate change. It was too risky. Senate Majority Leader Harry Reid pulled the plug on the bill in summer 2010. That fall, Republicans went hard after House Democrats who had voted for it, causing many to lose their seats—and Democrats to lose control of the House. And on the campaign trail last year, Obama followed the advice of his staff and barely mentioned climate change, to the dismay of his environmental base. Suddenly, that’s all changed. Now, it seems, Obama can’t stop talking about climate change. In both his Inaugural Address and the State of the Union, he spoke at length and with passion about his commitment to tackling the warming climate. Last month, in a sweeping, nearly hour-long speech, Obama presented a historic set of new climate policies, centered on Environmental Protection Agency regulations to slash coal pollution. EPA’s new administrator, Gina McCarthy, will soon set off on a high-profile road trip to tout the climate rules in speeches, public meetings, town halls, and wherever else there’s a case to be made. The “banned in Boston” dead-tree version of Rolling Stone is hard to find in most places, due to a wrong-headed non-controversy about the cover. But now Jeff Goodell’s story is online, in a special, first-of-its-kind-for-rollingstone media enhanced version, with several embedded videos that the Dark Snow media team produced during its stay in Sisimiut in early July. One video RS did not use was the one I shot from our Air Greenland chopper as we floated along the 400 foot calving wall of the world’s fastest moving ice-stream, the Ilulisat, or Jakobshavn glacier – see above, and Jeff’s description below. A few weeks ago, on a blue-sky day on the west coast of Greenland, our helicopter swooped along the calving front of the Jakobshavn glacier, flying dangerously close to a 400-foot-high wall of ancient melting ice that stretches for about six miles across Disko Bay. Jakobshavn is the fastest-moving glacier in the world, and it is sliding into the sea at a top speed of 170 feet a day. How quickly this giant slab of ice and snow – and hundreds like it across the North and South Poles – disappears is the biggest uncertainty in the world of climate science. The faster these glaciers melt, the faster seas will rise, inundating cities throughout the world, and the more unpredictable the world’s weather system is likely to become. Our future is written in ice. The chopper cruised back and forth at the southern edge of the glacier, looking for a patch of open ground that Jason Box, a 40-year-old glaciologist who is leading the expedition, had identified in satellite photos. Box and the pilot exchanged words on the intercom, then Box gave a thumbs up. The chopper touched down on an unremarkable stretch of rocky tundra about the size of a Walmart parking lot, and Box jumped out, followed by a videographer. “Welcome to New Climate Land,” he announced and then launched into a giddy, erudite stand-up monologue for the camera that would have made his high school science teacher proud. “For thousands of years,” he explained, this spot had been covered by a tall building’s worth of ice and snow. But now, in the past few months, the final traces of that ancient ice had disappeared. “We are likely to be the first human beings to ever stand on this piece of ground,” Box said excitedly.